Standard - £12.99 Only 7 left! So you're a Pokemon fan, are you? But perhaps you're more than a fan. Perhaps you're ambitious and desire to catch all the Pokemon, including that cute little guy, Pikachu. Well if you're bent on capturing Pikachu, you're not the only one. Jessie from Team Rocket has been after that little guy for years, and all without luck. She does occasionally have a bit of a tantrum, but at least she has one sharp fashion sense. Seriously, who else do you know could pull off magenta hair? Exactly. So if you find yourself relating to an ambitious, fashionable Pokemon trainer, perhaps you need to get hair like Jessie's too. 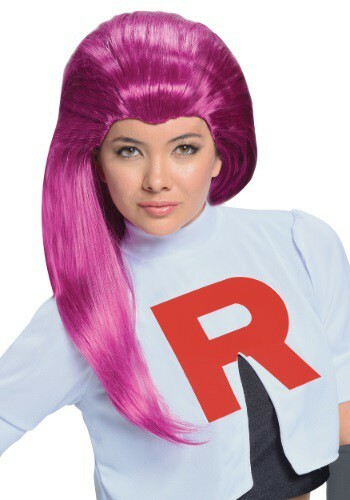 We recommend this Adult Jessie Team Rocket Wig. It's synthetic hair, swept back to form a widow's peak. It'll be the perfect addition to your Pokemon Trainer outfit for sure. Go Team Rocket!